Tonnages: 14,651 gross, 9,896 net, 23,655 deadweight. Main Dimensions: 534.4 x 75.2 x 34.1 feet. September 1971: Completed by Haugesund Mekaniske Verksted, Haugesund (Yard No. 40) for Lyle Shipping Co. Ltd., Glasgow. Scottish Ship Management Ltd., Glasgow, managers. 1974:	Re-engined by Amsterdamsche Droogdok Maatschappij, Amsterdam with two Stork Werkspoor Diesel 12 TM 410 Medium Speed Engines. 12,000 bhp 15 knots. Bareboat chartered to British Phosphate Commissioners, Australia. Conversion to Australian crewing conditions carried out whilst being re-engined. 1978:	Ownership transferred to Lyle Motorship Co. Ltd., Glasgow, Scottish Ship Management Ltd., Glasgow, managers. 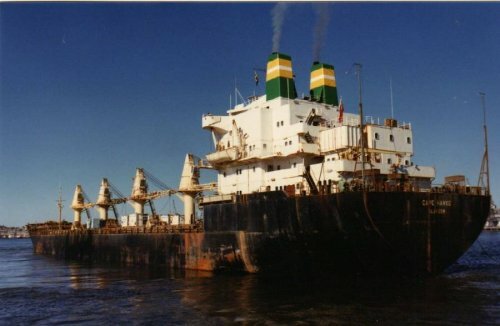 1979:	25th November, sailed from Ocean Island for Australia with the island’s last cargo of phosphate. 1981: Returned to owners by British Phosphate Commissioners and bareboat chartered to Australian National Line, Australia. 1986: 15th December. Broken up at Kaohsiung. Top photograph taken at Townsville, 30th November 1973, loaded with sugar.